Here we have China’s Dragon providing us with a cool take on the stealth helicopter that took part in - and crashed during - Operation Geronimo, the night raid in Pakistan that resulted in the death of arch-terrorist Osama bin Laden. 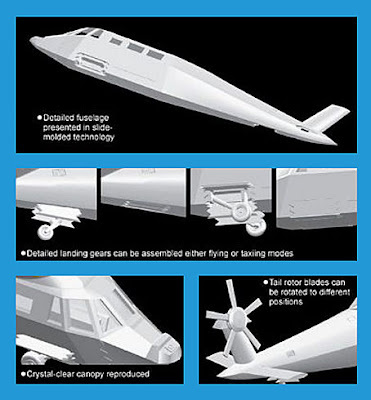 Apart from the tail section, which the world clearly saw from crash photographs, this Dragon kit is a work of intelligent surmise, but fascinating for all that, and the people in the Dragon team have clearly worked hard to produce a realistic and highly possible stealth helicopter design. Somewhat surprisingly, the kit is to a smallish 1:144 scale, perhaps a bit of a pity to those of us who like our models as big as we can get ‘em. 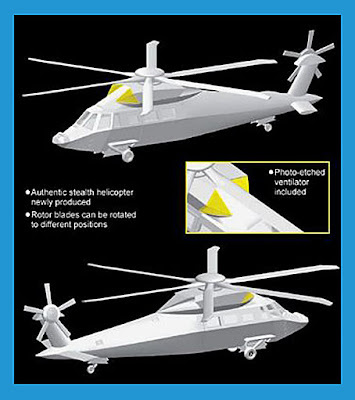 Still, let’s not be churlish, it’s a new-tool 'what if' kit of this special-ops helo, and includes details such as angled surfaces, photo-etch intake details, landing gear that can be assembled in up or down position, and a convincing six-pack of swept rotor blade tips. 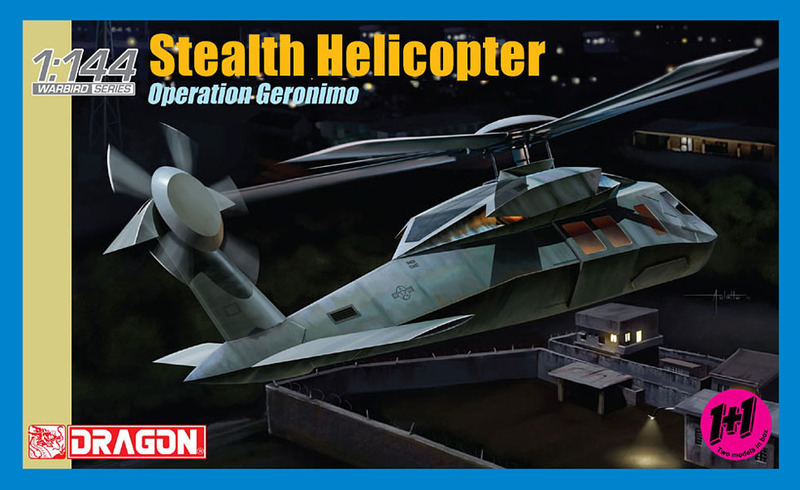 Unusually, two complete stealth helicopters are supplied in the box, giving you the choice of ‘gear up and down’, or ‘flying and crashed’, or any other scenario you feel like. The 1+1 concept is a neat idea for this small scale, and the dramatic box-art is really quite excellent. 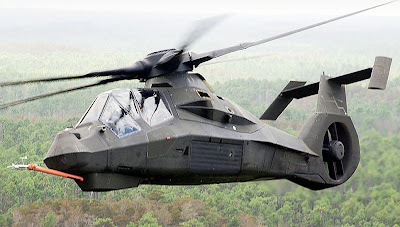 Remember the US Comanche stealth helo? It was cancelled because of skyrocketing costs. Still looks great though!